Once reserved for trendy commercial spaces, three-dimensional wallpaper is now the go-to tool for home designers wanting to make a luxe statement. As these category standouts prove, the value is all in the details. Created by fashion designer turned wallpaper visionary Maya Romanoff, this wall covering serves as a dual light magnet thanks to tiny glass beads laid atop metal leaf. During production of Graham & Brown’s textured vinyl wallpaper, heat is applied to a thin application of PVC that rests on the nonwoven paper. Blowing agents within the PVC coating expand with heat to create an embossed effect. York Wallcoverings has a product archive dating back to the 1700s, but printing innovations have allowed it to stake a claim in modern times. 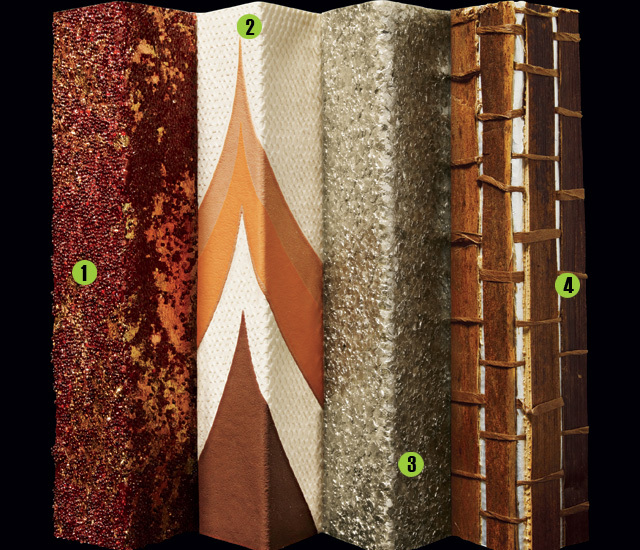 A mechanized technique lets the company funnel materials onto a backing, creating detailed, glitter-flecked sand designs sold alongside wallpaper made with recycled windshield glass, printed cork, and flaked mica. Los Angeles-based Astek juxtaposes the natural and the man-made: Thick reeds and sturdy grasses are handwoven over a silver metallic wallpaper.